A young surveyor at a leading property agency in Ashby (UK) is already making waves in the pipeline industry after a presentation about her work won a prestigious Midlands competition. 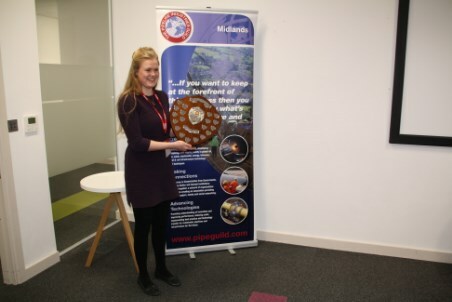 Lucy Whitaker, a 23 year old graduate surveyor who joined Fisher German’s Ashby office after leaving university in September, entered the Sir John Parker Competition, run by the Young Professionals of the Pipeline Industries Guild (PIG). Participants had to present about anything to do with the pipeline industry – as long as it was related to work they have done. After being encouraged to enter by her colleagues, Lucy’s presentation was shortlisted for the Midlands final alongside two others – one from Cadent Gas and the other from Wessex Water. And Lucy’s presentation, ‘Pipeline Encroachment: Prevention is Better than Cure’, was deemed as the best by the panel of judges. She was presented with the Sir John Parker trophy after her win, and will now head to the national final of the competition in May. Lucy said: “I’m so pleased my presentation was chosen as the winner by the judges – the competition was very tight and the three presentations were on very different topics so they were hard to compare. “Participating in the competition was really useful for my line of work, and it is great to meet lots of other people in the pipeline industry while I was there. Lucy studied Rural Enterprise and Land Management at Harper Adams University, and spent a year at Fisher German as part of her course. And after her year with the firm, she was offered a job subject to completing her studies, which she did in 2018. Lucy is hoping to take her APC exam to become a chartered surveyor this autumn. “Fisher German was a great company to work for during my placement year, and since I joined as a graduate surveyor in September they’ve encouraged me to get better and better,” Lucy added. Clare Phillipson, regional managing partner of the national Utilities and Infrastructure region of Fisher German, said it was not surprising Lucy ended up winning the competition. “Lucy has really impressed us at Fisher German despite only being with us for a short time,” she said.